So you learned how to knit, you learned how to purl, you learned how to bind off and now you want to know how to crochet bind off. Well, you have come to the right place. Here, you will find FREE and EASY instructions with pictures on how to execute the crochet bind off. In knitting, after you have finished using the stitches for your purse or bag you need to bind them off so they are no longer "live". Binding off (sometimes called casting off) is when you link the stitches together to stop them from unraveling. Why use a Crochet Bind Off? The crochet bind off comes in handy for those projects that have a very large amount of stitches or if you want to make sure that your bind off edge has a very nice consistency to it. 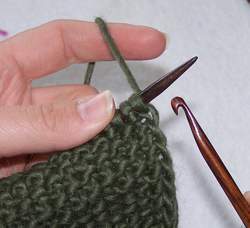 For the crochet bind off you use a crochet hook instead of a needle in your right hand to work the stitches. 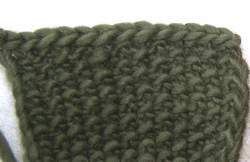 Essentially, you will be working each live knit stitch into a crochet slip stitch (Sl St). Sound confusing? TRUST US it is as easy as the basic bind off and will soon become your favorite bind off method to use! 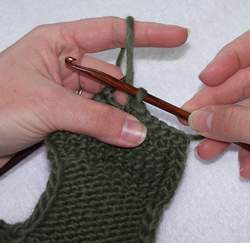 Instead of a needle, hold a crochet hook in your right hand and your work in you left hand. Insert the crochet hook as if to knit into the first stitch. Yarn over and pull the loop through leaving it on the hook as you would the needle. Repeat step 2. You now have two stitches on your hook. Just as you would do a slip stitch in crochet, pull the closest stitch on your hook (purple arrow) through the back stitch on your hook (red arrow). You have now finished or bound off the back (red arrow) stitch and are left with one stitch (purple arrow) on your hook. Repeat steps 3 and 4 until all your stitches are bound off except the very last one. When you are left with the very last stitch on your hook just yarn over and pull that loop through the last stitch on your hook. Now, cut the yarn from the working yarn being sure to leave at least a 5 inch tail. Then pullthe last loop through the stitch. There you go, your project is completely bound off. Congratulations, you just did a complete crochet bind off! All you do now is weave in the tail in the back of your work and voila, you are done! Little Tip: It is important that you bind (cast) off is not too tight. Anything that pulls at the knitted fabric is too tight and should be redone. A quick and easy way to make sure you don't bind off too tightly is to use a hook one or two sizes bigger in your right hand than you used on the knitted fabric. Now that you know how to knit and you know how to purl and you know how to bind off and crochet bind off you are ready to begin a purse or a bag!